It’s Spring and that means summer is right around the corner (cheers of celebration and praise)! But with all of that beautiful sunshine and humidity comes those little pests that irritate our skin while we are out barbecuing. 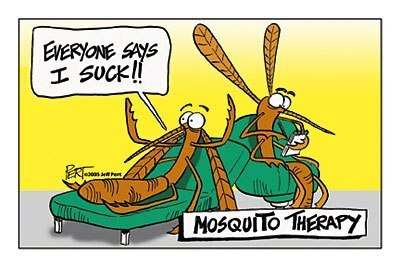 Some interesting new research has shown that not only are mosquitoes attracted to body heat and the carbon dioxide expelled while breathing, they can actually smell!!! These little guys harbor diseases like malaria, West Nile Virus, and Zika, so we need anything in our arsenal that we can find to combat them. This study concluded that mosquitoes have an olfactory receptor for human sweat and when genetically blocking this receptor, mosquitoes were much less interested in their human targets. This could be a big development in pest repellent! Check out the article here. Happy Easter from Dr. Piro’s office! How do animals protect their skin? Justin Bieber reveals he’s using hyperbaric oxygen therapy? Zach L on Magical Shakes at M Street Baking Company! © 2018, Brighton-Howell Dermatology. All Rights Reserved.